Roger Federer did win 3 Grand Slams losing Roland Garros final against Rafael Nadal back in 2006 as Novak Djokovic has done this year 2015, he has won 3 Grand Slams (two of them beating Roger Federer in the final) but he lost against Wawrinka in the French Open (Roland Garros is the only one major title that has not been conquered by Novak Djokovic). In 2006 Federer had a matchless balance as he won 92 games losing only 5. 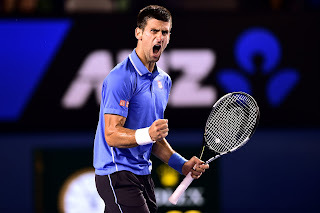 Novak Djokovic has won 82 matches losing only 6 this 2015. That year, 2006 by Roger Federer it is deemed as the best tennistic year ever performed by a player in tennis history (ATP history in real terms), yet take a moment to look the incredible 2015 tennis year of Novak Djokovic. Novak Djokovic has played all the finals of the tournaments he has been therein (Doha aside, it was the first one of 2015 season and he lost against Ivo Karlovic in quarter finals). Novak Djokovic has won ATP World Tour Finals in London and 6 Atp World Masters 1000 (the most important ones after the four Grand Slams) he emerged victorious from Shanghai, Paris, Beijing, Rome, Monte Carlo, Indian Wells and Miami but he even had a superb year likewise in 2011 when he won 3 Grand Slams, 10 titles with 70 won matches and only 6 losses. Overall Novak Djokovic has won 10 Grand Slams losing another 8 finals. He has also won Davis Cup with Serbia and he got a bronze medal in 2008 Beijing Olympics, he was also a runner-up with his country Serbia in another edition of Davis Cup. In 2011 he was 41 matches in a row unbeaten until he lost against Roger Federer in the semi-final of Roland Garros at the end of May, 2011. The are other two tennis players who made history as well, Rafael Nadal in 2010 had a memorable year, he won 3 Grand Slams (French Open, Wimbledon and US Open) he lost the final of ATP World Tour Finals against Roger Federer but he for instance won all the major titles played on clay (Roland Garros, Monte Carlo, Rome and Madrid). Similarly, John McEnroe won 2 Grand Slam titles with a balance of 82 won matches, 13 trophies and only 3 losses in 1984.